On Monday, services are being held throughout Russia to commemorate the victims of the plane crash near Katyn. Among the perished were the President of Poland, Lech Kaczynsky, and the country’s top officials. National flags across Russia are being flown half mast on this day. All entertainment programs on TV have been cancelled. In Moscow people have been queuing at the Polish Embassy to express their condolences. On Monday Russia’s President Medvedev visited the embassy. He laid flowers at a specially-installed photograph of Polish president Lech Kazcynski and his wife Maria. Dmitry Medvedev signed the book of condolences and spoke to the Polish ambassador Jerzy Bahr. Many Russian officials have paid visits to the embassy, among them the Foreign Minister Sergey Lavrov and former Soviet president Mikhail Gorbachev. Ambassador of Poland Jerzy Bahr told RT that Poland is deeply touched by the sympathy of the Russian people. People in Smolensk flocked to the gates of the airport near which the plane crash happened. Whole families came to lay flowers. Some of them tried to do it away from the cameras, leaving flowers on the hoods of the TV companies’ vehicles. Polish journalists set up a provisional monument with candles at the Katyn cemetery for their compatriots who perished. A hotline was established in the city. Hundreds of people phoned to express their condolences, say prayers and offer material help. Monday has been declared a mourning day in Europe after the Polish tragedy. In the neighboring Ukraine people are laying flowers at the Polish Embassy. Vigils are to be held throughout the country. The grief is especially strong in Western Ukraine, where, due to its proximity to Poland, a lot of family ties exist across both sides of the border. Russia will do everything to investigate the Smolensk catastrophe fully and objectively, assured Russian Prime Minister Vladimir Putin at government’s session on Monday. “We grieve in unison with the Polish people,” he said. “The state committee is working, and of course we will do all that depends on us to make the investigation full, objective, and to determine all reasons of the catastrophe,” the prime minister stated. 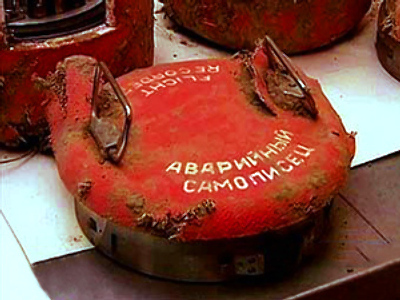 Transcription of the flight data recorders will be carried out with close collaboration of the Polish party, reported to Prime Minister Vladimir Putin Russia’s Deputy Prime Minister Sergey Ivanov during the government’s session. 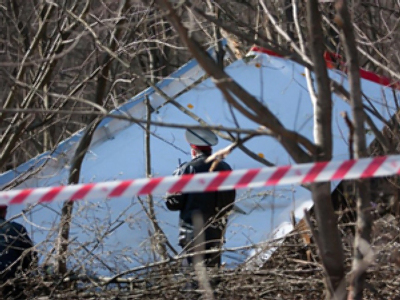 On Sunday at the Intergovernmental Air Committee, both flight data recorders were opened, in the presence of representatives of Polish prosecutor’s office and the Interior Ministry, he said. “The technical condition of both recorders is satisfactory,” Sergey Ivanov stated. “It allows us to carry out detailed transcription and analysis of all flight data and work of the plane,” he added. “Further work in transcription and analysis of the received information will be undertaken in close co-ordination with the Polish authorities,” Ivanov said. The two conclusions can be made for today. First, that the “flight data recorders were fully operative and have registered absolutely all information until the plane crashed to Earth,” stated Russia’s deputy prime minister. Second, it has been “accurately confirmed that warnings about negative weather conditions in Severny airport and recommendations to go to an alternative airport were not only sent, but also received by the crew,” he confirmed. Polish investigators, along with their Russian colleagues, are still working on the site to collect all the information in order to find out exactly what happened. The official version is that the cause of the plane crash was human error. “The record of flight communications proved that there were no technical problems with the plane. The pilot was informed about the poor weather conditions. Nevertheless, he took the decision to land,” says Aleksandr Bastrykin, the head of the investigation committee. The bodies of those killed have been taken to Moscow. Relatives continue to arrive to identify their loved ones. Moscow authorities are ready to pay all the expenses connected with their stay in Moscow. Psychologists of the Emergency Ministry along with their Polish colleagues are on duty to offer help if necessary. The Polish minister for health has arrived in Moscow to assist in the process. So far, 45 people have been identified, including the wife of the Polish president, Maria Kazcynska. The process is expected to take quite a long time, as in many cases DNA tests will be required.